It’s always important to bear in mind what you can and cannot take away from spring practice. A good play for the offense is a bad one for the defense and vice versa. Some things on offense work that wouldn’t in a game because they’re not doing any real hitting. A lot of teaching is going on, so some things may not look quite right because a coach wants his players to focus on a detail to the exclusion of other things. These have always been and will always be true about spring practice. 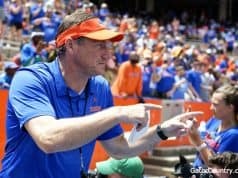 So with the appropriate caveats in place, there are some signs of a second-year improvement for Dan Mullen’s program in the reports from spring practice. For starters, everyone knows what they’re doing this time around. Pat Dooley and Robbie Andreu of the Gainesville Sun agreed on Dooley’s podcast last week that things are much more organized compared to spring practice a year ago. Dooley mentioned that Chuck Heater, a top defensive assistant at UF during Urban Meyer’s tenure who’s now back as a quality control coach, told him that Mullen is doing a great job in that regard. Andreu compared seeing how the Gators worked to watching a pro team go through its routine. The same effect is in place in the weight room too. Nick Savage was able to skip some of the conditioning that was required last year because, after a year in his program, the players were in much better shape. He also knows the guys better after spending some time with them, so he can better individually tailor his mental tactics. The upshot of both of those factors, Savage said, was “from the get-go we were able to put the gas pedal down”. These dynamics, especially the motivational one, will come into play not only now but in the long offseason between spring and fall camp when Savage is the only coach allowed to work with the players. Moving down to the field, there are some things going on that aren’t a “good news or bad news?” conundrum. For instance early enrollee corner Chris Steele has been getting some rave reviews while running with the starting defense while Marco Wilson continues to recover. He’s not been perfect, of course, but he’s holding his own. To get this kind of work in early is invaluable for a guy who will need to start in 2020, even if he doesn’t in 2019 with Wilson and CJ Henderson around. 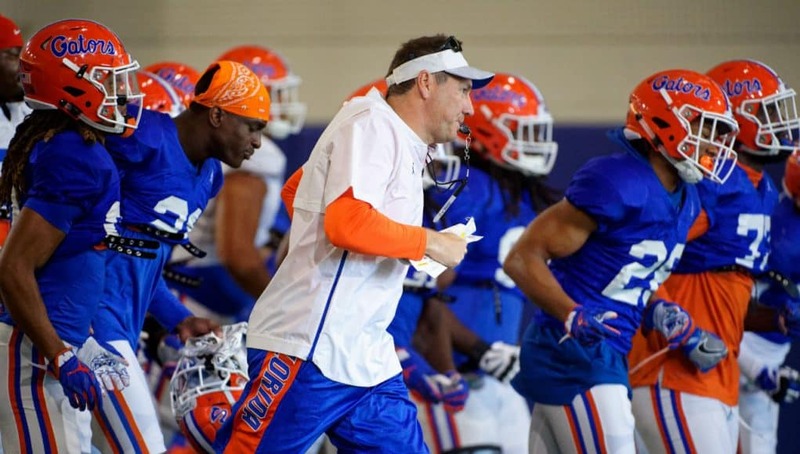 Florida competes for the DBU title annually by having a pipeline, and what Steele is doing right now will keep the Gators in that hunt for years to come. Even more than that, though, is the improvement of the wide receivers and their route running. Precision in routes just didn’t exist under the last coaching staff, and while 2018 saw some gains with Billy Gonzales doing the teaching, there was still more to be done there. It sounds like the wideouts are continuing to get better in this department, particularly in the red zone. It would be a help to Feleipe Franks, who only completed 47.9% of his passes in the red zone a year ago. We’re also seeing some clarity coming to positions of uncertainty. The middle of the defensive line was solid but unspectacular last year, and we are still waiting to see if the nose tackles behind Kyree Campbell will fulfill their true potential. At the defensive tackle spot, though, we’re seeing a couple of the bigger defensive ends in Zach Carter and Malik Langham get some reps. The defensive tackle spot in Todd Grantham’s offense is not like a DT spot in a traditional 4-3. In most 3-4 defenses, it’d be called a second defensive end spot with the nose in between them. Grantham still calls it a defensive tackle position with the Buck working like an end most downs, but you could see last year with former West Virginia defensive end Adam Shuler winning the starting job that it doesn’t necessarily require a huge body taking up space. Earlier this offseason I wrote about how Mullen and Grantham prize hybrid defenders who can fill more than one role. Carter especially is now becoming one of those players along the line after he dominated the first scrimmage with four or five sacks. From there, the practice reports devolve into the normal spring ambiguity. The defensive line is having a great spring, but are those guys great or is the new-look offensive line struggling? When Franks forms a habit of throwing picks to new Buck player Jonathan Greenard, is it the Louisville transfer having a knack for dropping into coverage or the quarterback struggling to read defenses again? When Franks finds his receivers well, are they beating their defenders or are the secondary guys falling down on the job? 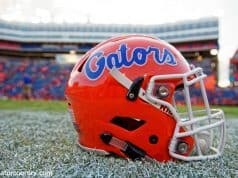 Those questions will persist beyond the Orange and Blue Debut, particularly the one about the offensive line. That’s how spring football works. 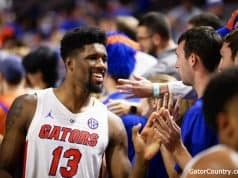 Still, from better organization and strength and conditioning practices to better fundamentals to recruits already living up to their billing and veterans expanding their repertoire, the Gators appear capable of building on their momentum from the end of 2018. The schedule this year is tough with seven projected S&P+ top 25 opponents, including three in the top ten and two in the top four, so UF could improve and still repeat their 9-3 regular season record. But if they want to do better than that, it appears right now that the pieces are there. Much of the rest will come down to film study, individual units working on stuff together, and weight room intensity after spring is over.